Sea & Sea has announced its much-anticipated housing for the Nikon D7100. Featuring the ergonomics and quality Sea & Sea is known for, the housing has access to the port lock outside the housing body. The new lens-lock release button allows divers to switch lenses without taking the camera out of the housing. This combination of features allows for quick switching between macro and wide-angle setups. The D7100 is sure to be a popular housing for underwater photography and the Sea & Sea Housing will be available starting July 12, 2013. 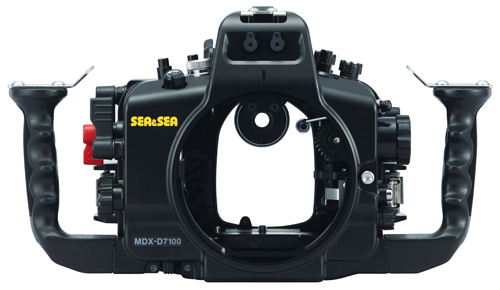 LONG BEACH, CA [July 2, 2013] SEA&SEA announces MDX-D7100 housing available July 12th. The much anticipated SEA&SEA MDX-D7100 housing will be available July 12th, 2013. The MDX-D7100 housing includes the port lock, 'lens-lock release' and leak-sensor. The port lock can be activated from outside the housing. The 'lens-lock release' button allows the lens to be replaced without opening the housing. In addition, the housing comes with a leak-sensor that is activated when moisture is detected. 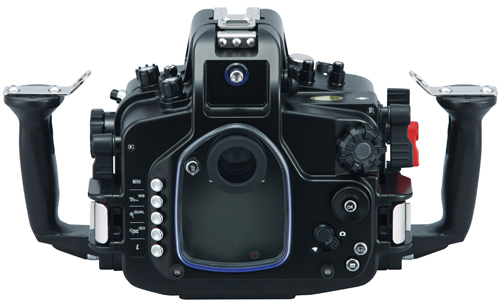 The MDX-D7100 multi selector is the same design as the camera control and can be operated in the same way. AF areas and Focus points can be changed by depressing the selector. The multi selector control is accessible with your hand on the grip making it very easy for the diver to activate. The handles have also been significantly improved with the traveling diver in mind. They are mounted with thread less fixings to facilitate easy transportation, and mounting and removing of them. The new design also alleviates corrosion build up around the fittings. MDX-D7100 is compatible with both VF180 1.2x and VF45 1.2x viewfinders. By attaching the VF180 or the VF45 prism viewfinders to the housing, the magnification increases by 1.2x and entire field of view can be seen at the same time. 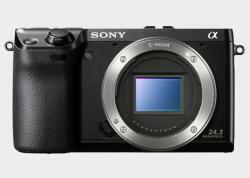 The housing comes with the option for a built-in optical YS Converter N, which converts the camera's TTL signal to a light signal. A fiber-optic cable allows for both TTL and manual strobe photography. The camera also features a built-in flash that can be activated and deactivated from the housing. With the camera's built-in flash raised and fiber-optic cables fitted, external strobes can be triggered as 'slave units' by the built-in flash. 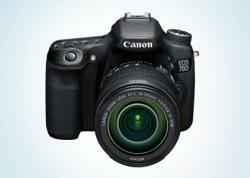 The MDX-D7100 (SS-06167) has a retail price of $2,999.95. 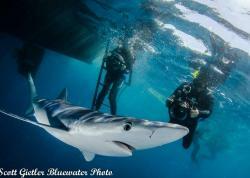 Be sure to check out SEA&SEA's Website and Facebook page for the latest product updates and more!